He was arrested in 2013 for campaigning against the generals that ruled the country after Mr Mubarak's resignation. 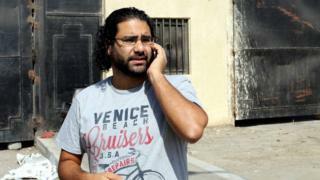 His sisters, Mona and Sanaa Seif, posted messages on Facebook on Friday stating: "Alaa is out." Sharing a picture of Mr Abdel Fattah playing with his sister's dog at home, they thanked everyone who "followed and supported" them during his jail term. Egypt's revolutionaries - where are they now? The pro-democracy activist's lawyer, Khaled Ali, also shared a post confirming his release, writing: "Thanks God, Alaa Abdel-Fattah at home." A video shared by the "Free Alaa" Facebook page showed Mr Abdel Fattah smiling, hugging and shaking hands with friends after leaving what appears to be a police station in the Egyptian capital, Cairo. The blogger and software engineer was once described by authorities as "the icon of the revolution". "I don't deny the charge," he said in a statement at the time. "It's an honour to hold responsibility for people's rallies in defiance of legalizing the return of the rule of Mubarak."